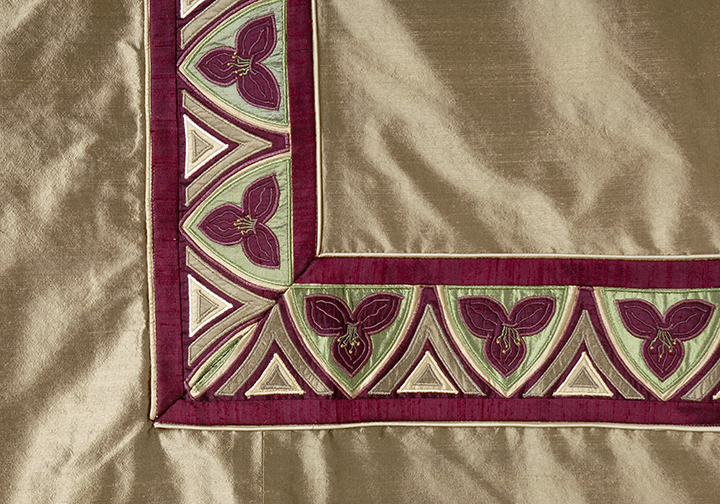 Appliqué is one of the oldest known art forms, dating back as far as 3,000 B.C. It is now almost a lost art. Thank goodness for Wende Cragg’s talent! Notice the rich textural details inspired by Old World Artisan Guilds in Wende’s creations. Her designs are inspired mostly from the Art Nouveau, Art Deco and Arts & Crafts periods but she also will incorporate other traditional motifs into meticulously-executed window panels, pillows and table runners. Her color palette hints of opulent jewel tones and the burnished metals. A bit like marquetry or stained-glass inlay, the appliqued composition can be manipulated to achieve shading and depth by “angling” the silk, turning it at 45 degrees to create subtle variations of the same color. Wende is a self-taught textile artist who has exhibited nationally for more than 35 years. She has been featured in numerous publications and is the recipient of dozens of awards. Her pieces are installed in residences from Italy to Hawaii and were recently included in the San Francisco Decorator Showcase. This is a detail of an applique’d duvet cover.